The Grumpy Economist: DB warns of US debt crisis. It's not as bad as it looks. The US is essentially the world's biggest hedge fund, borrowing abroad to invest in risky projects abroad, and we earn the premium on doing it. But overall, we are still borrowing to finance a trade deficit. Like me, the DB report still sees a US debt crisis as a fairly remote possibility. Still not all their reassurance is reassuring if you think about it. Borrowing in your own currency only means that our government can substitute inflation and devaluation for explicit default, if it refuses to fix its finances. That number looks suspiciously low -- I don't think it has federal, state, and local and all taxes in it. At all levels we're spending north of 40% of GDP. And raising a lot more revenue would mean middle class taxes like a VAT. Finally, debt crises are choices, and the main issue is really whether our government will raise nearly 10% of GDP in taxes to fund entitlements, reform the entitlements, or let the country drift to crisis. the US dollar is the de facto global reserve currency. This last point is significant. 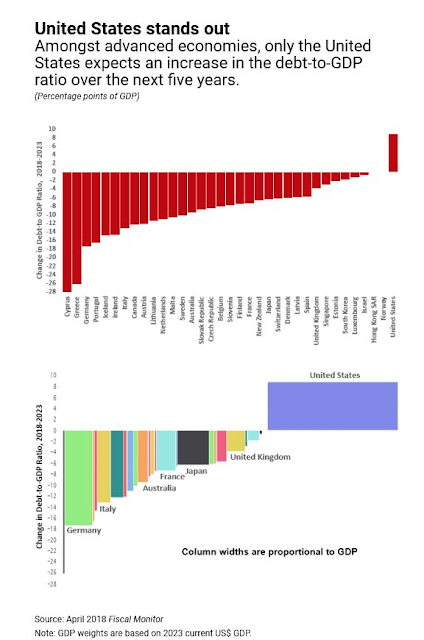 Figure 12 shows that almost two thirds of global official reserve assets are held in US dollars. One out of every four dollars lent to the US Treasury comes from the foreign official sector. These institutions need a safe, deep, and liquid place to park their reserves. That our debt is currently held as reserves by foreign official sectors with the above-stated need should not be quite so reassuring. It is a source of one-time demand for our debt, not for eternal expansion of that debt. Those are also "hot money" investors. A demand for safety can evaporate pretty quickly if everyone starts to worry about a dollar crash. The appeal of Treasuries is further boosted by the US’s military strength, the nation’s cultural appeal, and strong domestic institutions. ...Treasuries tend to rally in episodes of market stress, even when US economic growth slowed sharply in 2008 or when China devalued its currency and signaled potential selling of its Treasury holdings in 2015. This is not happening today, which is why investors need to pay attention to whether an EM-style debt crisis is about to play out. As we wrote earlier this year (see: 2018-02-22 US Economic Perspectives), a similar pro-cyclical fiscal policy was deployed in the 1960s and resulted in higher inflation. The magnitude of the divergence is set to be even more severe in the current episode. The report concludes with a number of technical indications that demand is softening for U.S. treasuries, just as we are starting to issue a boatload of them. Short duration, meaning a huge amount is rolled over; softening foreign purchases, expectations of more devaluation meaning our apparently high yields aren't so high, and declining bid to cover ratios. Like DB, I agree it's not imminent. It will need a precipitating event like a recession, war, or crisis. Except that when it is imminent it already happened. The world needs safe, liquid assets. Historically, this need has been filled by Treasuries- and it still is. Demand has thus far been inelastic [sic] despite the increase in supply (Figure 19). Treasuries have rallied for 30 years, rates continue to slide lower, and the stock of debt continues to expand. Eventually, however this will become unsustainable. We cannot say exactly what level of debt (85% of GDP? 100%? 125%?) will prove to be the tipping point, but we do believe that the latest fiscal developments have increased the odds of a crisis. Investors should continue to monitor Treasury auction developments and will remain alert to any indications of softening demand. Great post! Would you mind explaining to me the rationale behind the elasticity comment? I thought DB's use of inelastic would be correct as although treasuries have been increasing in price the demand has not faltered? I thought they meant that prices have not changed a lot even though the US has tripled the supply. I may have misunderstood. I also read the inelastic comment as Zack did. Like the hypothetical miracle drug I first learned about in macro class, demand is the same regardless of price. John's comment is right (at least in a micro perspective). Supply has trippled at nearly constant prices, that means price elasticity of demand needs to be very high. Great summing up and thought experiment. But impossible to analyze the US in isolation. Any buildup to a fiscal crisis in the US would be felt around the world much before it affected American markets. And that American public authorities could not adjust things over time. There is no way that thresholds debt/GDP of 85%, 100% ans 150% are comparable because the underlying behavior of policymakers in the US (and around the world) would not be the same at different levels. Perfect! You see countries like Germany, Sweden, Norway or Denmark have much more generous social programs than the U.S. So it's not the entitlements after all! Hmmm, what can it be? Perhaps tax rates on the makers are too low? "the main issue is really whether our government will raise nearly 10% of GDP in taxes to fund entitlements, reform the entitlements, or let the country drift to crisis." That is a question? You can bank the crisis. It is the biggest lock ever. Yeah, I’m surprised “Do Deals” hasn’t been on here yet to tell us all, for the hundredth time, that the debt doesn’t matter at all and can be completely ignored. He seems to be convinced that paying off dollar denominated debt in dollars (no matter what they are worth) is all that is required to satisfy lenders. What level of inflation is considered "default"/ 3%? There he is! No, 3 percent isn’t default, but I’m not sure inflation would stay at 3 percent if we announced tomorrow that we are no longer worried about the debt, no longer going to bother tracking it, or making fiscal plans with deficits in mind. Call it a devaluation rather than crisis. Then we face a normal, historically understood process. I think the speed of the devaluation is a factor that might differentiate a “normal” devaluation from a crisis. So, we're not on the verge of a mass deleveraging like in 2008? I mean, sheesh, 3.5T roughly in QE to unfreeze credit markets after a 14T loss in real estate and stock market wealth? I agree, the dollar as THE reserve currency is a good thing -- as long as that perception holds. There's all this madness with yield curve inversion, and if one were to plot to the actual yield curves over time between the 3mo-10yr treasuries, even after removing the oil shock of the 70's, it ends up being a pretty good indicator of a recession incoming. What's also disturbing is the level of global debt that's historically high. So, we have inflation creeping up towards 2% (or past it, but that's a lag issue), The Fed wants stop being doves, and we have a ballooning debt in the US, it makes one wonder: Can the Fed really do anything? It's not like they go back to the zero bound and QE all over again. Timing is everything. Ha. And, it's not as if Congress can really wrap their heads around what's going on with demographic transition in the US. Just seems like a mess incoming. But, hey, predicting 7 out of the last 5 recessions is better than 9. There's more to address like the labor force participation rate and structural unemployment, which affects GDP -- it may all seem like noodles, but I'm concerned that the debt on the fiscal side being issued isn't going to be leveraged for productive activitie, particularly infrastructure spending or education, which have good returns (forget crowding out for now). Also, on the monetary side we didn't see massive inflation from QE due to sterilization from the Fed. I could go on and on but I'm an amateur at best when it comes to all this stuff. Ha. The Grumpy Economist surely gives plenty reason to actually BE grumpy. I sure do enjoy this blog. Ha. P.S. Bernanke and helicopters? Good idea to pull AD? I have heard an argument that the trump tax cuts might be less expensive than they appear for the following reason: since they raise the equilibrium interest rate, they give the fed more room to cut rates to zero if a recession looms. So they lower the risk of recession and the severity of any prospective recession. 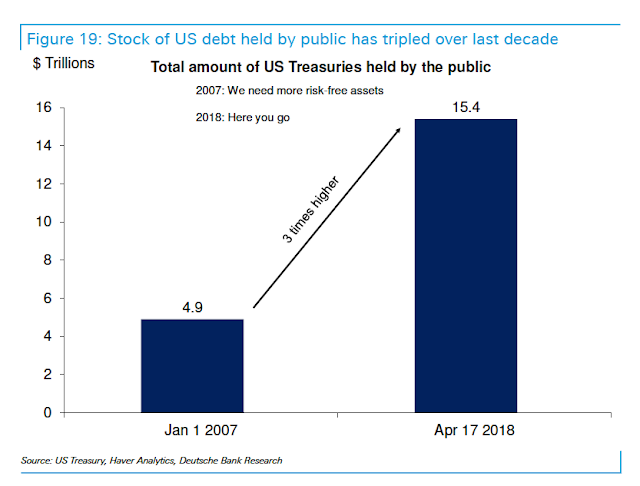 A counter argument would be they give us less room to borrow when the next recession strikes, but I’m not sure what “having room” would mean: if there is another recession, treasuries will presumably become attractive investments. I have also heard that a larger stock of treasuries, being safe liquid assets, lowers the risk of financial crises, but I do not know if I trust this. Care to comment on what the tax cuts mean for our risk of recession? "A counter argument would be they give us less room to borrow when the next recession strikes, but I’m not sure what “having room” would mean: if there is another recession, treasuries will presumably become attractive investments." In a recession, the volume of trade falls and the associated tax revenue that accompanies that trade falls with it. Based upon falling tax revenue to fund interest payments on U. S. debt, do Treasuries become more or less attractive during a recession? Also, recessions (falling real gross domestic product) can be accompanied by high inflation (aka stagflation). In the extreme case you get falling tax revenue AND low / negative real interest rates making Treasuries decidedly unattractive on two fronts. There's no need to have a positive rate of interest just so that interest rates can be cut come a recession for the simple reason that stimulus can always be done via fiscal means. Of course there is the problem that under present arrangements, a fiscal boost requires the permission of a bunch of pig ignorant jerks known as "politicians". That's a particular problem in the US, while it's less of a problem in the UK, where the finance minister can and sometimes does change taxes at the flick of a switch. And in fact Milton Friedman and Warren Mosler have advocated PERMANENT zero interest rate. "And in fact Milton Friedman and Warren Mosler have advocated PERMANENT zero interest rate." INCORRECT. Milton Friedman advocated a zero nominal interest rate AND a positive real interest rate. "Therefore, nominal rates of interest should be zero. In practice, this means that the central bank should seek a rate of deflation equal to the real interest rate on government bonds and other safe assets, to make the nominal interest rate zero." Key phrase - "the central bank should seek a rate of deflation". With a 0% nominal interest rate and 3% deflation, the real interest rate becomes positive 3%. 5% on 20 trillion = $1 trillion per year interest expense. By comparison, we spent about $800 billion last year on Defense. So we will be adding the equivalent of an additional Defense Dept as interest rates rise. It ought to be an interesting debate in the Congress, when the topic is "Do you want Social Security or do you want Defense next year...because we can no longer afford both." It should be born in mind that most of the so called "interest" on government debt is illusory: that is, the real or inflation adjusted rate of interest on the debt at the moment is around zero. "It ought to be an interesting debate in the Congress, when the topic is - Do you want Social Security or do you want Defense next year...because we can no longer afford both." Tell any Congressman to pick two and I doubt any would chose #3. The world needs safe, liquid assets." Says who? Safe from what? Does that mean we as U. S. taxpayers should contribute to a world wide system of Social Security - anyone in the world can collect - but only U. S. citizens pay the taxes to ultimately fund it? You realize how nonsensical this sounds? Safe from devaluation via risk -- either perceived or real. Take your pick. Surpluses are leveraged to fuel economic activities. Whether or not they are productive is another matter entirely. No one wants to throw good money after bad unless they have a risk tolerance that is like iron. It's all based on trust in the end. It's why institutions matter. I agree with Frank: at least in that just because someone somewhere wants interest on their savings, there is no obligation on US taxpayers to have to dish out dollars so as to satisfy the latter desire for interest. 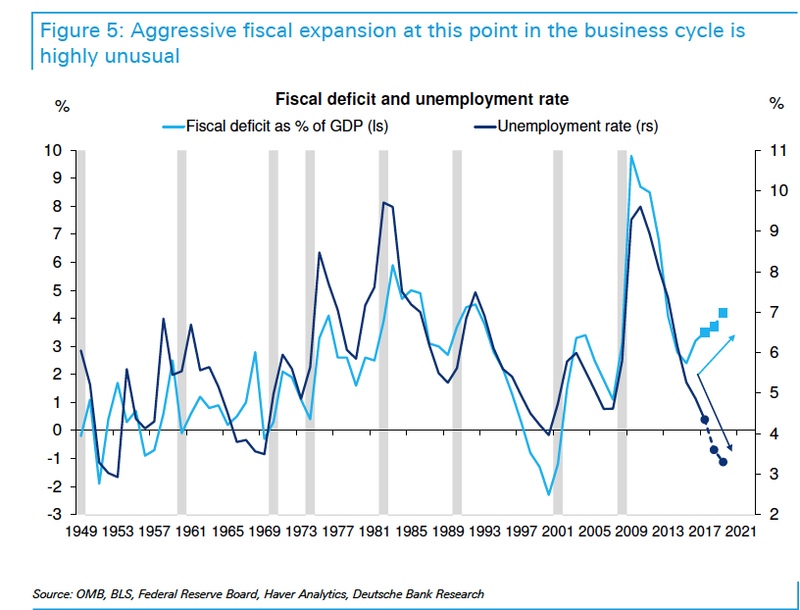 "There is a good reason past deficits did not really spook markets. They understood the deficit was a temporary phenomenon, due to temporary poor demand-side economic performance. We do not have that excuse now." Really, the recession of 1980-81 was a recession as a result of poor demand-side economic performance? And what exactly constitutes "temporary" deficits? By your own graph, the U. S. ran a deficit ranging from 1.5% to 8% of GDP from 1970 to 1995 spanning three recessions. The numbers on the chart for Canada seem to be quite unrealistic. Given the dysfunction in the Federal government and the Provincial governments in Ontario, Alberta and B.C. the debt to GDP ratio in Canada seems likely to go up. Boy, so much to talk about on this post. 1. Easy solution: move your assets to another country. 2. Too much in Treasury volume outstanding in the future? Yes, but…the Bank of Japan has bought back 45% of JGBs, and they are under 1% inflation. QE remains a cipher. For now, it appears a central bank can buy back national debt without consequence…so if there is "too much" in Treasury volume outstanding, can the Fed just buy it back? 3. Yes, entitlements (largely funded by payroll taxes, except for the VA, which is funded by income taxes). But do not forget the US spent $16 trillion on "national security" through the Bush and Obama administrations. And that function is rising again. Sometimes that function elevated to "global security," with no pretense made the spending is actually for defense of US shorelines. Multi-nationals have global guard service at US taxpayer expense? Where are the libertarians and anarcho-capitalists when we need them? I would say the the federalized welfare and warfare perma-states share blame. But most welfare spending is just a shuffle among private parties (see Social Security). Warfare spending is the federal government seizing money out of your pocket and the private sector, for macro-economically parasitic reasons. 4. The Donks have no fiscal discipline, and the 'Phants even less. The US does not have a fiscal policy. Plan accordingly, but remember, QE may be an relief valve. Not in theory, but in fact. Such total nonsense in both the CBO and the DB reports. And people throwing the word "default" with reference to a devaluation/inflation without quantifing when it becomes a problem. Pure scare tactic unbecoming of professional/academic articles. Nothing scary about devaluation as FDR told us. If we do not prepare then we get the Nixon shock of 73. But that happens to be two generations in a row that devalued, and looking back farther we find generational default common. Old folks die and new folks do not pay debt incurred before they were born. This is a Roger Farmer thing, he is the first economist to discover death. 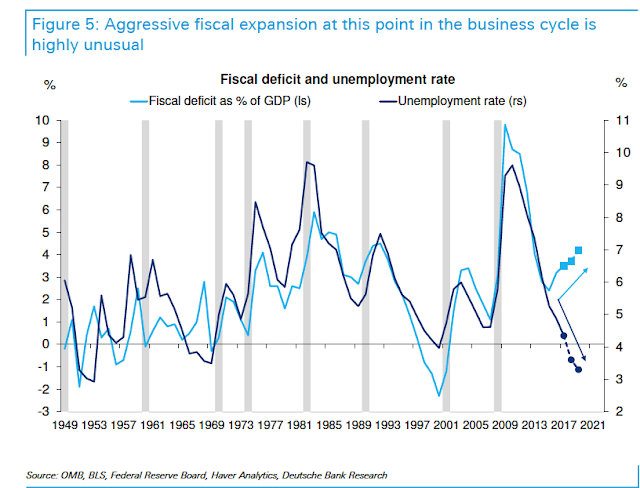 RE: "... “the likelihood of a fiscal crisis in the United States would increase. There would be a greater risk that investors would become unwilling to finance the government’s borrowing unless they were compensated with very high interest rates.” ... ..."
• CBO is full of crap of course. There can be no fiscal crisis if you issue, borrow in, and float your own currency. RE: "... can substitute inflation and devaluation for explicit default, if it refuses to fix its finances. ... ..."
• If there are excess resources in the economy, how would there be inflation? A devaluation would cause a temporary blip, but once domestic production takes up the slack, why would inflation continue? And isn't increasing exports (result of devaluation) a good thing as long as there is unemployment in the economy? RE: "... let the country drift to crisis. ... ..."
• What crisis? Spell it out for us. Paint us a picture. Total nonsense. RE: "... It is a source of one-time demand for our debt, not for eternal expansion of that debt. Those are also "hot money" investors. A demand for safety can evaporate pretty quickly if everyone starts to worry about a dollar crash. ... ..."
• We should not give a crap what investors think of the dollar. We have the Fed. RE: "... 70s inflation was led by fiscal, not just monetary, troubles: ... ..."
• The 70s inflation was led by an Oil Embargo as a result of the Yom Kippur War. RE: "...Eventually, however this will become unsustainable. We cannot say exactly what level of debt (85% of GDP? 100%? 125%?) will prove to be the tipping point, but we do believe that the latest fiscal developments have increased the odds of a crisis. ... ..."
• Why? How? Paint us a picture. No one ever does. Such nonsense. "Borrowing in your own currency only means that our government can substitute inflation and devaluation for explicit default, if it refuses to fix its finances". I don't understand the point. Yes, a nation with its own currency (and no foreign denominated debt) can always easily "pay off" its debts. For example, if the US wanted to payoff China - it would debit China's security account at the Fed (where the Treasuries reside) and credit China's reserve account at the Fed with the same dollars. Done. The debt is gone. No more dollars - just a transfer. This transaction is similar to a QE transaction. Prof. Cochrane himself has explained that such activities are merely changing the composition and duration of the private sector portfolio (in the above example China's) and thus they are not a big deal and they are not inflationary. So I'm with DoDeals. The debt is a non-issue. Criticisms welcome. Thanks. Do Deals...we do give a crap about the dollar because we buy a lot of stuff from other countries and we do care about our standard of living. "If there are excess resources in the economy, how would there be inflation?" It depends on which resources you are referring to. We live in a world that currently has a fixed amount of a number of resources (water, oil, land, etc.). Sure new technologies are invented that allow us to recoup spent resources and use what is available more efficiently. But those technologies take time to develop. As individuals we are each granted a limited amount of time on this Earth - time being the most precious resource of all. "A devaluation would cause a temporary blip, but once domestic production takes up the slack, why would inflation continue? And isn't increasing exports (result of devaluation) a good thing as long as there is unemployment in the economy?" Devaluing one currency relative to another makes all goods (land, equity, bonds, fixed resources, manufactured goods) cheaper. That is why devaluing alone rarely improves the balance of trade in goods. "What crisis? Spell it out for us. Paint us a picture. Total nonsense." 1. The private banking industry refuses to submit bids for U. S. government debt. Under current law, the central bank is not permitted to directly submit bids at auction for U. S. government debt. This would leave the U. S. Treasury scrambling to find buyers for it's debt. Call this a debt rollover "crisis". 2. The interest payments on U. S. government debt exceed the available tax revenue to service that debt. Call this a cash flow "crisis". I realize that "crisis" is a scare word, but their are legal limitations to what the central bank can do. There are also philosophical discussions to be had about what the fed should be able to do. And if you say - "Well just change the Federal Reserve Act", that's fine - but remember that changing the law requires a majority vote in both Houses of Congress and a Presidential signature. "We should not give a crap what investors think of the dollar. We have the Fed." Who is this we that you are referring to? Do you have a direct phone line to Jerome Powell (Fed President) or Richard Clarida (Fed Vice President)? I sure don't. We have a representative democracy consisting of Democrats, Republicans, and other political party members. Your vote for Fed purchases of U. S. debt is cancelled by my vote against it. "The 70s inflation was led by an Oil Embargo as a result of the Yom Kippur War." That is a partial explanation for the 1973 oil embargo, but let's not forget that the reason that the Arab countries began the embargo was because the U. S. supplied arms to Israel during that War - hence it was led by a fiscal operation - tax payers pay money for arms and deliver them to Israel. And it doesn't explain the 1979 rise in oil prices either. "Why? How? Paint us a picture. No one ever does. Such nonsense." I just did. A failed U. S. government auction and / or tax revenues insufficient to service the interest on the debt COMBINED WITH legislative inaction would likely result in a "crisis". Final words - It is not nonsense to look ahead and forecast potential problems in the future. Probably the most glaring omission from the CBO report is the political environment that exists today in the U. S. That alone should be weighed into the odds of a "crisis" unfolding. Donk: If the dollar falls, yes, foreign assets become more expensive. But lets' consult Mr. Arithmetic shall we. Annual US imports are $2.9 Trillion or 14.5% of GDP. A one time increase in these prices is hardly going to turn us to Zimbabwe (AAAaaahhhhh!!!!!) And our exports are $2.3T. Our goods and services will become more competitive and the trade deficit would likely swing to surplus. We would quickly get to Full Employment and any Job Gty expenditures will drop pretipitously. What's the problem again? RE: "... which resources you are referring to... ..."
• Reources consist of 2 things: PEOPLE and DIRT. That's all. We have plenty of people, who would shift from the Job Gty program to export industries when the dollar falls, and we have pl\enty of dirt. The newly working people produce MORE GOODS AND SERVICES for export and domestic consumption. So no inflation. What's the problem again? RE: "... makes all goods (land, equity, bonds, fixed resources, manufactured goods) cheaper. That is why devaluing alone rarely improves the balance of trade in goods. RE: "... The private banking industry refuses to submit bids for U. S. government debt. Under current law, the central bank is not permitted to directly submit bids at auction for U. S. government debt. ... but remember that changing the law requires a majority vote in both Houses of Congress and a Presidential signature. ..."
• Well then we ned to get rid of Republicans and elect Bernie Sanders. RE: "... but let's not forget that the reason that the Arab countries began the embargo was because the U. S. supplied arms to Israel during that War - hence it was led by a fiscal operation ... ..."
• WTF are you talking about? Fiscal operations? Nonsense. It was purely political to get US to soften support for Israel. "A one time increase in these prices is hardly going to turn us to Zimbabwe. And our exports are $2.3T. Our goods and services will become more competitive and the trade deficit would likely swing to surplus. We would quickly get to Full Employment and any Job Gty expenditures will drop pretipitously. What's the problem again?" The problem (again) is that it didn't work for Ronald Reagan (Plaza Accord) and it didn't work for George Bush Jr.
"• Well then we ned to get rid of Republicans and elect Bernie Sanders." Again, who is this "we" that you keep referring to? And the attempt to elect Bernie Sanders was shot down by the Democratic Party. If you can't get him elected in his own party, what makes you think he would get anywhere in a national election? "• WTF are you talking about? Fiscal operations? Nonsense. It was purely political to get US to soften support for Israel." Do you think that Israel was fighting the Yom Kippur War with sticks and stones? "As a result, Israel was totally dependent on the United States for military resupply, and particularly sensitive to anything that might endanger that relationship. ."
We're told on the one hand that our trade deficits are good because other countries accumulate assets to purchase our debt. Then we're told that trade deficits are bad because.....who knows why? 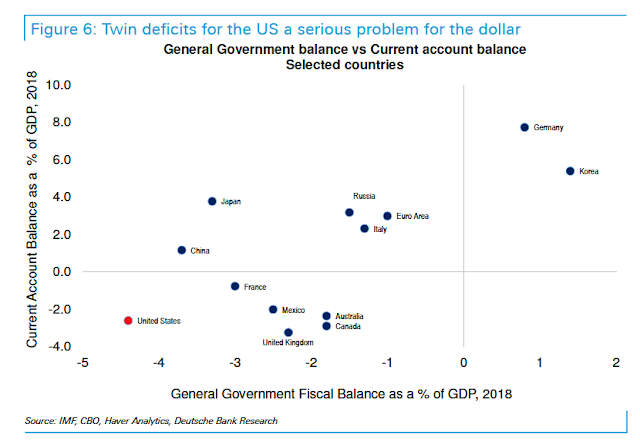 Then we're told that china and japan are better off because they run surpluses and they can finance their own budget deficits. Do you see that we're having convoluted circles run around us to explain things? If we borrow in our own currency, and it's the main reserve currency, then it doesn't matter whether we run trade deficits or not. Because us or "them" will buy the debt. Whoever has the money. So many things that make no sense are taken as orthodoxy and swallowed whole. There are many of us, maybe even John, who are wondering how we could have such a major increase in debt and not have bad effects, high inflation, high interest rates, falling dollar, some visible deterioration in reserve currency status. This is my explanation. In the graph the "from" borrowing amount is actually pretty good. Prior politicians had some discipline. I would also argue that perfect U.S. government would have some borrowing. They buy capital items, aircraft carriers, buildings, and some borrowing for capital items is allowed. So we went from below normal debt to probably what is "normal" debt for a country debt to gdp wise. Now to use up that gap in ~10 years with no major wars and to fix recessions seems like a waste. But how can you expect voters to respond to excessive borrowing when they see no bad effects? Some recent politicians must feel like the luckiest people in the world. With all due respect to you and the Professor, The US government debt is not a problem in any way shape or form. In fact, it can be repaid tomorrow without a negative repercussion. That would simply involve replacing government bonds with deposits at the Federal Reserve Bank with similar interest and maturities. The similar or even better risk/reward terms assure no change in investor savings/spending preference or desire to hold dollars. Not recommending this course of action, just pointing out that it is possible. My understanding is that an auction can never fail because the buyers are lined up BEFORE the auction. That is, if there were a problem, it would be addressed at that time. While I don't know all of the legalities (if any), even if bonds were not sold, the Fed could simply credit the Treasury's TGA account at the Fed (from which the Treasury spends) and spending would continue. As Beardsley Ruml (President of the NY Fed) noted decades ago (1946) "The purpose of Treasury issuance is not to fund spending - but rather to provide a safe, interest-bearing asset for the private sector". Marriner Eccles (Fed Chairman at the time) also made similar statements as he understood that the state could never run short of the dollars which itself issued. "My understanding is that an auction can never fail because the buyers are lined up BEFORE the auction. That is, if there were a problem, it would be addressed at that time." "In the United States, a primary dealer is a bank or securities broker-dealer that is permitted to trade directly with the Federal Reserve System ("the Fed"). Such firms are REQUIRED to make bids or offers when the Fed conducts open market operations, provide information to the Fed's open market trading desk, and to participate actively in U.S. Treasury securities auctions." Can a bank revoke it's own primary dealer status? Certainly. Can enough primary dealer banks revolt to cause a crisis? Unlikely, but not outside the realm of possibility. "While I don't know all of the legalities (if any), even if bonds were not sold, the Fed could simply credit the Treasury's TGA account at the Fed (from which the Treasury spends) and spending would continue." That gets into a Constitutional issue. The power to spend and the power to coin money lies exclusively with the Legislative Branch of government. A U. S. Treasury (Executive Branch) that received credits from the Fed without express consent from the Congress would likely run afoul. "The purpose of Treasury issuance is not to fund spending - but rather to provide a safe, interest-bearing asset for the private sector." I wholeheartedly agree with this - yes that is the ultimate purpose of interest paying government bonds - they are an insurance policy (or entitlement if you prefer). But I don't think that Ruml or Eccles ever anticipated that the private sector should include foreign states. Nor did Ruml or Eccles address the question of whether the Treasury SHOULD provide a safe, interest bearing asset for the private sector. It is an open question of whether the U. S. Treasury - in the face of deficits instituted by the Congress - MUST sell borrow / bonds because of a legal obligation. Certainly, if directed by the Congress, the U. S. Treasury must acquiesce to their directions in terms of taxation, spending, and borrowing. However, as currently constructed, the U. S. Congress maintains a debt ceiling - but not a debt floor. It is also an open question as to whether the Congress can legally implement a taxation and spending policy and then refuse to borrow or print money to make up the difference in the face of a deficit. The Constitution is silent on the subject. It gives the Congress plenary power over taxation, spending, borrowing, and the coining of money, but it does not insist that the numbers add up correctly. There is no Constitutional requirement that elected Representatives be able to balance a checkbook, or even do simple arithmetic. In that case it would be left to the Executive Branch of government (Article II, Section 1, Clause 5) to fulfill Congress's wishes without infringing on powers granted solely to the Congress. DoDeals- thank you for the information. Frank - also thanks for providing detail on how the auctions work. I understand the legal impediments to various transactions. However, I want to understand the economics independent of the arbitrary institutional arrangements. For example, I think DoDeals point about merging the finances of the Treasury with the Fed gives us a good picture of what is going on in terms of the combined economic impact of the overall government position on the non-government (private) sector position. So assume, say, the Fed owns Treasury securities as an asset and the Treasury has the same securities as a liability. I think it is fair to then say that these securities are effectively gone - from the standpoint of the non-government (private) sector. Legally, they will not be combined and offset, as you have explained. But I don't think that changes the economics. Thanks. "I understand the legal impediments to various transactions. However, I want to understand the economics independent of the arbitrary institutional arrangements." The institutional arrangements between the various bodies of the federal government and the central bank are anything but arbitrary. It wasn't as if someone flipped a coin to decide between representative democracy and autocracy or between having a central bank and having no central bank. The pros and cons of each institutional arrangement as they were formed, destroyed, and reformed were argued at length amongst economists, legal experts, and others over time. To "understand the economics" you need to understand why certain institutions and arrangements within those institutions were created in the first place. "So assume, say, the Fed owns Treasury securities as an asset and the Treasury has the same securities as a liability. I think it is fair to then say that these securities are effectively gone - from the standpoint of the non-government (private) sector." Uh, no they are not effectively gone from the non-government sector. I (as a member of the private sector) am still paying taxes to make the interest payments. Just because the Fed remits the interest payments back to the Treasury does not excuse me from paying the taxes. The Fed has a choice of legal options - remit or don't remit. I don't have the same choice - pay taxes or don't pay taxes. Wall St says us gov bonds have been in a bull market for 30 years with total returns better than stocks and based mostly on price appreciation not yield (0%). The question of whether us bonds are elastic or not might be better phrased as, are bubbles elastic? In a bubble demand increases as the price increases, right? As for yield curve inversion, why? Is it because long duration us gov bond holders refuse to sell at a lower price? Is the us gov bond market really deep and liquid? Does the yield curve show that is not the case? Maybe bubbles are inelastic and crashes are elastic? In a bubble price doesn't matter but in a crash it does.